Some market commentators have unearthed esoteric explanations of the ongoing credit crunch. A case in point is the suggestion that current conditions constitute a “Minsky moment". References to the musings of Hyman Minsky were perhaps driven by a belief that citing an obscure theory might make one seem learned. But, there are better explanations for the worrying liquidity flows that cause so much anxiety on global markets. Minsky posited a “financial instability model" that depicted risky financial practices being undertaken during periods of financial tranquillity. He felt stability was a source of instability since banks lend more during booms due to surging profits that companies deposit into the banking system. In other words, financial markets are inherently unstable, so that wild swings in economic activity can only be averted by imposing regulations. This view is consistent with “post-Keynesian" thinking that depicts money as emerging from within the economic system rather than from actions taken by central banks. Minsky’s thinking is flawed—he mistakenly reverses real world cause-and-effect, where central bankers throw the savings-to-loans ratio out of kilter by pumping up the money supply. It is systematic monetary expansions external to the market system that cause upsets within the economy. Observed instability is not caused by internal market forces as Minsky would have it. His presumption that markets are inherently unstable is not supported by history or theory. The best evidence that markets are generally, inherently stable is that every day billions of people engage in trillions of transactions within millions of markets. And this occurs more widely with each passing day. “Bubbles" and severe panics are quite dramatic, but remarkably rare. Were markets inherently unstable, they would have been abandoned long ago. If market outcomes are out of balance, disequilibrium between bid and offer prices set into motion stabilizing forces. Persistent disequilibrium requires that an outside force block entry or competition. This insight applies to financial markets where large cyclical swings or persistent imbalances are caused by the artificial suppression of interest rates. This allows credit to expand without any change in economic fundamentals. Throwing excess money into the system adds fuel to pump air into asset bubbles. Without that fuel, prices in other sectors would be depressed by an offsetting amount. The fingerprints of loose monetary policy are all over— from the South Sea bubble to tulip-mania to dot-com burnouts. Central bankers create “false" signals of artificially lower interest rates that induce investors and entrepreneurs to undertake investments that are later revealed to have been rash. Even so, their actions are rational given the distorted signals of artificially lower credit costs. By fiddling with interest rates, central banks induce “clusters" of investment errors of simultaneous involvement of many investors, even market experts. In turn, clusters of business failures occur as investors tend to over invest in a specific market in reaction to misleading information about super-profits. This collective problem ends in a market glut. Such error clusters occur if entrepreneurs simultaneously receive the wrong signals on potentially profitable positions. As it is, rational individuals do not tend to act in the same way even when given the same information. 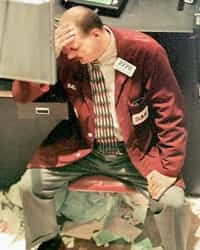 The argument behind the concept of a Minsky moment is that markets are inherently unstable and require extensive regulation to avert wide swings in economic activity. But the reverse is almost certainly true. The observed markets instability has been caused by outside forces, so there should be less regulation from the monetary authorities. The present credit crunch was a signal that some of the ill-advised borrowing and lending caused by central bank monetary and credit policy was being unwound. But that was not to be, as the US Fed cut the federal funds interest rate by 0.5 percentage points and decreased its discount rate charged on direct loans to banks, by the same amount. The intention in lowering rates for the first time in four years was to reduce risks of recession in the face of a housing slump and financial market turmoil from subprime mortgage problems. To be polite, this was the most breathtakingly stupid policy decision taken over the last millennium! This sort of ill-advised move should be no surprise since it is merely a continuation of a ruinous set of monetary policies that started under Alan Greenspan’s stewardship. Bereft of sufficient insight to understand the perilous conditions in global markets were of their making, the current leadership of the Fed has stayed the course. This only delayed an inevitable correction, possibly in the hope someone else would be blamed when the ship does hit the sand. Before the rate cuts, markets tried to drain off some of the excess liquidity as bankers and investors realized the party was over and were going home to avoid a hangover. But the Federal Reserve decided to refill the punch bowl so that loose lending practices could continue. Stay tuned for inevitable economic pain that will now be more severe and more widespread, thanks to incompetent and misguided central bankers.